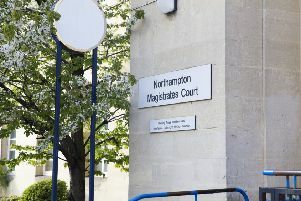 A 46-year-old man who took a 12-inch knife into a Northampton pub after he drank half a bottle of vodka has been given a suspended jail sentence. David Addis of Oak Grove, Headlands, Northampton, was arrested on January 22 after police received reports that a man was telling people in The Collingtree pub that he had a knife tucked in the back of his jeans. Northampton Crown Court heard that, when asked by officers why he had the knife, Addis said he had “no idea”. Rachel Law, prosecuting, said Addis told the officers he had drunk at least half a bottle of vodka as well as some beer and had also taken some heroin and crack cocaine. Recorder Justin Wigoder said: “Goodness knows why you took the knife into the pub tucked in your trousers. Addis was sentenced to three months in prison, suspended for a year. He must also complete a 12-month supervision order including a four-month drug rehabilitation order.